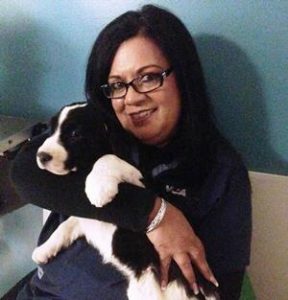 In her position as Hospital Manager at VCA Animal Specialty Group, Sonni Nevarez plays a key role in helping save the lives of pets in need of critical veterinary care. The VCA Animal Specialty Group provides both emergency care as well as specialized and surgical care for sick and injured pets. “My role as a hospital manager is to always find ways for owners to provide care for their beloved pets,” she explains. Sonni works closely with FACE to help clients in financial need. “With the help of the FACE Foundation, I have the ability to SAVE several pets a year that are in desperate need of medical care from being euthanized,” she says. “I love seeing owners be able to take their pet home after a very long emotional roller coaster ride of dealing with an emergency situation with their pet. We are often able to give HOPE where there often is none!” Sonni has fond memories of many FACE success stories that passed through the doors of VCA Animal Specialty Group over the years. Sonni has been with the hospital for 17 years, first as a technician and now as Hospital Manager. Sonni’s love for animals motivated her to become a vet tech, and she takes pride in helping families and alleviating the suffering of their pets. Sonni helps other animals besides family pets. “Through my work, I have also had the opportunity to work with the Lions Tigers & Bears Big Cat and Exotic Animal Rescue in Alpine, CA. There is nothing more beautiful than seeing a big cat in its habitat and up close!” she says. When not at the hospital, Sonni enjoys spending time with her 25 year old son Tony, who has cerebral palsy. They love fishing and also go to Las Vegas every year to see the Professional Bull Riders World Finals. Sonni values her working relationship with FACE. “The staff at the FACE Foundation are always so eager to work with us and get owners qualified as quickly as possible,” she notes. She is a great advocate for FACE, and shares information at VCA regional meetings and with local veterinarians. FACE thanks Sonni Nevarez and everyone at VCA Animal Specialty Group for all of the amazing work they do to help pets and their families.